, a great persecutor of the Christians in the beginning of the fourth century, was at first president of Bithynia, and afterwards governor of Alexandria; in both which situations he acted with great cruelty against the Christians. 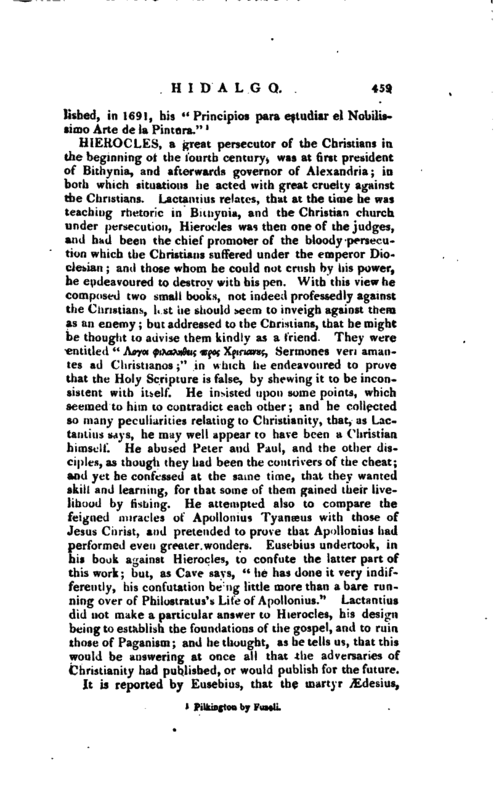 Laotantius relates, that at the time he was teaching rhetoric in Bithynia, and the Christian church under persecution, Hierocles was then one of the judges, and had been the chief promoter of the bloody persecution which the Christians suffered under the emperor Dioclesian; and those whom he could not crush by his power, he endeavoured to destroy with his pen. With this view he composed two small books, not indeed professedly against the Christians, lest he should seem to inveigh against them as an enemy but addressed to the Christians, that he might be thought to advise them kindly as a friend. They were entitled “Aoyoi <piK*Kn8ei$ ts^ X^navaj, Sermones veri amantes ad Chnstianos” in which he endeavoured to prove that the Holy Scripture is false, by shewing it to be inconsistent with itself. He insisted upon some points, which seemed to him to contradict each other; and he collected so many peculiarities relating to Christianity, that, as Lactantius says, he may well appear to have been a Christian himself. He abused Peter and Paul, and the other disciples, as though they had been the contrivers of the cheat; and yet he confessed at the same time, that they wanted skill and learning, for that some of them gained their livelihood by fishing. He attempted also to compare the feigned miracles of Apollonius Tyanaeus with those of Jesus Christ, and pretended to prove that Apollonius had performed even greater wonders. 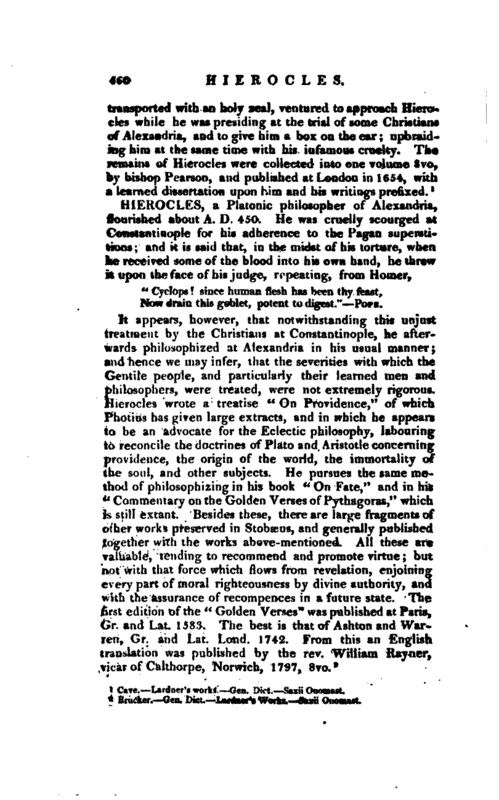 Eusebius undertook, in his book against Hierocles, to confute the latter part of this work; but, as Cave says, “he has done it very indifferently, his confutation being little more than a bare running over of Philostratus’s Life of Apollonius.” Laclantius did not make a particular answer to Hierocles, his design being to establish the foundations of the gospel, and to ruin those of Paganism; and he thought, as he tells us, that this would be answering at once all that the adversaries of Christianity had published, or would publish for the future. Cave. Lardner’s works. Gen. Dict. —Saxii Onomast.